This protocol is a cost-effective alternative for expressing naked plasmid DNA in mouse skin. The overall goal of the protocol is to deliver immune-related genes into skin tissue to delineate the functional role of a specific gene in cutaneous inflammation. Lin, Y. J., Lee, T. L., Ku, C. C. Development of an Economical DNA Delivery System by "Acufection" and its Application to Skin Research. J. Vis. Exp. (122), e55206, doi:10.3791/55206 (2017). Dysregulation of immune response in skin is associated with numerous human skin disorders. Direct transfer of immune-related genes into skin tissue is a fascinating approach to investigate immune modulation of cutaneous inflammation in mouse models of human diseases. Here we present a cost-effective protocol that delivered naked DNA in mouse skin and leads to transgene expression. The method is coined "acufection", denoting acupuncture-mediated DNA transfection. To perform acufection, mouse skin was first infused with DNA in phosphate-buffered saline (PBS) and then pricked lightly with a bundle of acupuncture needles to facilitate the absorption of DNA and transfection into cells. The plasmid DNA is presumably taken up by the keratinocyte and dendritic cells (DCs) in the skin and expressed into protein. Mechanical prick with the needles per se did not cause skin damage or induce keratinocyte activation. The expression of the transfected genes was detected in the skin at both transcriptional and translational levels following acufection for 2 days and maintained up to 7 days. The primary goal for the development of this acufection method was to investigate a previously undefined isoform of IL-15. Using this method, an alternatively spliced IL-15 isoform with partially deleted exon 7 (IL-15ΔE7) was expressed in the skin and subsequently treated with a Toll-like receptor 7 (TLR7) agonist, imiquimod (IMQ), to induce inflammation. Acufection-delivered IL-15ΔE7 in skin suppressed keratinocyte proliferation, epidermal thickness and neutrophil recruitment in IMQ-induced cutaneous inflammation. With increasing interest in identifying the regulatory mechanisms of cutaneous inflammation, the protocol described here provides a cost effective and versatile alternative to the gene gun system or microseeding for DNA delivery in vivo. It may potentially allow discovery of the function of a novel gene in the skin or for investigating new treatment for cutaneous diseases. Skin is the first-line of host defense. Keratinocytes (KCs) are the major cell type in the skin of humans and mice. In response to environmental stimuli (e.g. sunlight, oxygen, chemicals and pathogenic invasion), KCs are activated and produce a wide array of proinflammatory cytokines and chemokines such as IL-8, IL-6, IL-1α, IL-1β, TNF-α and GM-CSF1. Together they trigger the recruitment of immune cells to the skin. Aggravated cutaneous inflammation is often associated with numerous human diseases including acute ectopic contact dermatitis and chronic T cell-mediated inflammation (e.g. allergic contact dermatitis and psoriasis)2. Modulating proinflammatory responses in the skin by inhibiting KC activation is a plausible approach to treat cutaneous inflammation. This protocol describes a new approach to transiently express a cytokine gene in the epidermis in order to study immune response consequential to such a treatment in the skin. The epidermis composes the most superficial layer of the skin. It serves as a physical barrier keeping external substances such as nucleic acids and pathogens from entering the deeper layers of the skin. Several needle-free techniques have been established for epidermal DNA transfer3,4. DNA in solution or associated with cationic liposomes or adenovirus vectors has been directly applied to the epidermis modified with techniques such as the removal of the stratum corneum or the treatment with depilating reagent. Removal of the cornified epithelium facilitates DNA crossing the epidermal barrier and interaction with keratinocytes and Langerhans cells to induce immune responses5. While a large surface area is available for DNA transfer and this approach does not involve needles, there are disadvantages including the requirement for the large quantities of DNA (10 - 100 μg), harsh treatment on the skin by stripping, and the inconsistent results in inducing immune response in the immunized animals without DNA delivery booster6. Microparticle-mediated intracellular delivery of naked DNA to the skin has been shown to be highly efficient and reproducible for inducing immune response7,8. A hand-held gene gun has been used to bombard the skin target site with plasmid DNA-coated gold particles 2 μm-diameter in size by means of pressurized helium air flow9. The plasmid DNA is presumably taken up by KCsand dendritic cells (DCs) in the skin and the protein is locally expressed or being transported to draining lymph nodes by DCs10. Although the gene gun system is simple and requires limited technical experience, the cost for preparing and delivering the "DNA bullet" (i.e. gold powders, helium gas) and for the gene gun itself has limited its general application. In addition, the requirement for a helium gas delivery system limits the ease of gene gun transport when the experiments are conducted at different locations. Microseeding has been demonstrated to achieve a higher efficiency of gene transfer than single injection and particle bombardment11. Microseeding uses a tattoo gun to deliver DNA to the skin without the use of particle beads11. Oscillating the microneedles on the skin using this approach is likely to directly scrape the cell membrane and thus transfer DNA to multiple cells at the same time. However, pain associated with the large number of injections with 0.254 mm-diameter needles is a disadvantage. Here we provide an alternative approach to DNA delivery in vivo. The "acufection" protocol we described here provides an economical and efficient way to deliver plasmid DNA in mouse skin. 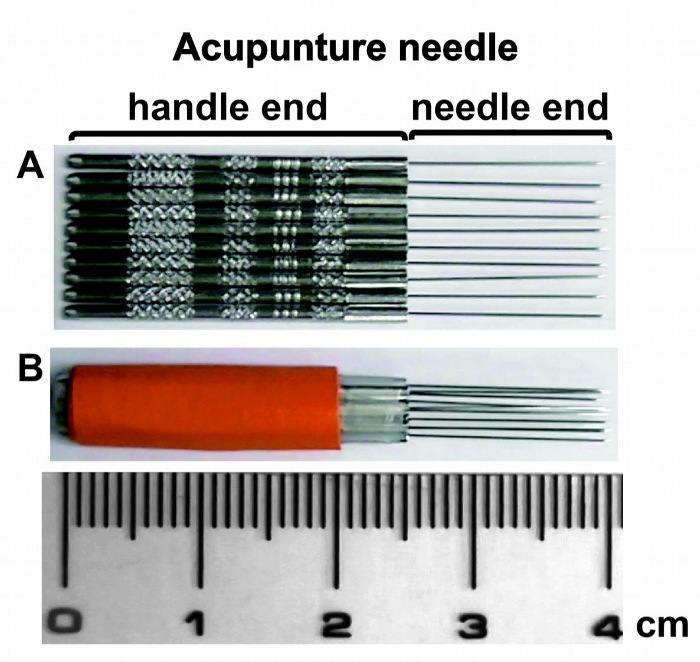 Briefly, ten acupuncture needles (0.2 mm in diameter x 13 mm in length) were bound in a bundle by adhesive tape. A volume of 10 μL of PBS with 10 μg of plasmid DNA containing the transgene of interest was placed on the shaved, depilatory cream-treated flank skin. By using the acupuncture needle bundle to oscillate the surface (1 cm x 1 cm) of the skin, the keratins at the horny layer were loosened and the plasmid DNA applied to the surface was absorbed into the epidermis. Skin damage was monitored and found to be minimal. Expression of the transfected gene in the acufected skin was confirmed by both quantitative real-time PCR (qRT-PCR) and ELISA. The immune modulatory effects of acufection-delivered IL-15ΔE7 on cutaneous inflammation were demonstrated using the IMQ-treated mouse model12. While acufection proves to be an easy and less demanding method for DNA delivery in vivo, the optimal amount of DNA for different genes and the times to prick the skin have to be carefully optimized to obtain reproducible results. Female mice at 8 - 12 weeks of age were used for this study. C57/BL6 wild-type (WT) and IL-15 deficient (Il15-/-) mice were purchased from National Laboratory Animal Center (NLAC), Taiwan and Taconic Farm, respectively. IL-15-deficient (Il15-/-) andIL-15-dominant (Il15+/- and Il15+/+) showed a 1:3 ratio in the second generation from the cross of Il15+/- heterozygotes. The genotype of Il15-/- mice was confirmed by PCR analysis. 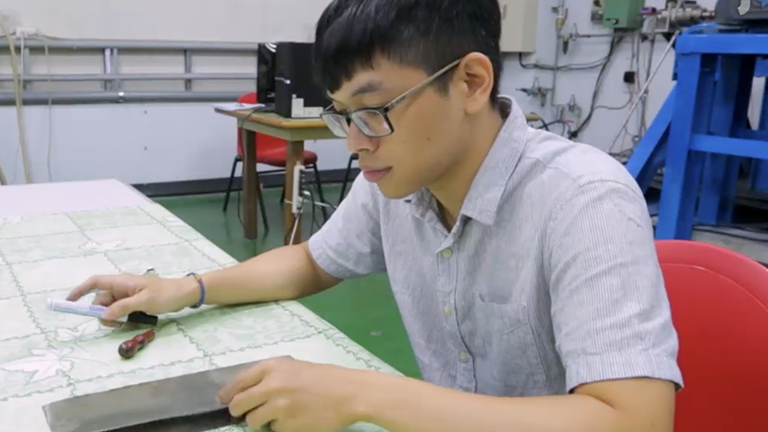 Mice were maintained in the Specific Pathogen Free (SPF) facility at Laboratory Animal Center (LAC), National Taiwan University (NTU) College of Medicine. All animal procedures including the anesthetic materials and methods were performed in accordance with the animal protocol approved by the National Taiwan University College of Medicine and College of Public Health Institutional Animal Care and Use Committee (IACUC) (Affidavit of Approval of Animal Protocol 20130225). NOTE: Acupuncture needles are medical devices composed of a handle and a needle end (Figure 1A). The diameters of the acupuncture needle ranged from 0.2 mm (36 G) to 0.35 mm (28 G). We select the finest point of the needle to avoid potential excessive cell damage during pricking the skin. There are 4 different lengths of the 0.2-mm needle including 13 mm (0.5 in), 25 mm (1.0 in), 40 mm (1.5 in) and 50 mm (2.0 in) in length. A bundle of 10 needles with 13 mm length provided the best comfortable grip during oscillating the needle on C57BL/6 mouse skin. The parameters could be modified if the method is applied to the skin of larger animals or performed by researchers with larger hands. Remove acupuncture needles from the sterile, non-pyrogenic package. Place the needles on a sterile drape. Use adhesive labeling tape to bind 10 needles together in a bundle (Figure 1B). NOTE: The 10 needles are geometrically arranged to form a cylinder shape. For convenience, use a piece of paraffin film to stabilize the arrangement before applying the adhesive tape. Make sure all the needle points are on the same plane. Using a bundle instead of a single needle facilitates maximal DNA infusion by increasing the contact area between the needles and the skin. Transform chemically competent bacterial cells with the plasmid DNA. Select and inoculate a single bacterial colony in 3 mL of LB medium containing antibiotics and incubate at 37 °C in a shaker overnight. Scale up the culture by diluting the bacterial culture at 1:100 in 250 mL of LB medium with antibiotics and shaking overnight at 37 °C. Prepare a large quantity of DNA by using a high quality, endotoxin free plasmid preparation kit following the manufacturer's instructions. NOTE: Acufection protocol requires high purity and a large quantity of plasmid DNA. Use of a high quality, endotoxin free and column-purified plasmid DNA is recommended. Elute DNA in sterile water. Store DNA in small aliquots at -20 °C until ready for acufection. NOTE: Avoid repeated freeze-and-thaw of DNA to ensure consistent plasmid DNA expression. Dilute plasmid DNA to 1 mg/mL in sterile PBS for acufection. NOTE: The optimal amount of DNA and the area of the target skin surface may vary for different genes and need to be further optimized. The pricking force and number of times to loosen the horny layer of the skin also may vary depending on the skin thickness. These conditions must be carefully determined after evaluating the expression level of acufected gene transcripts by qRT-PCR. Weigh the mice and administer tribromoethanol (400 μg per gm body weight) by peritoneal injection. NOTE: 2,2,2-tribromoethanol is an injectable anesthetic agent that was commonly used in mice. Solutions are made by dissolving a non-pharmaceutical grade 2,2,2-tribromoethanol (2.5 g) in distilled water (200 mL) containing 2.5% of 2-methyl-2-butanol. Use vet ophthalmologic ointment on eyes to prevent dryness under anesthesia. NOTE: Anesthetic effect will be induced in 1 - 2 min. Check the toe pinch reflex to ensure sufficient depth of anesthesia before operation. Shave the dorsal flank skin and apply depilatory cream to dissolve keratin proteins in the hair shaft. NOTE: Use of depilatory cream to remove hair will facilitate infusion of DNA into the skin. Use water soaked cotton balls to wipe off the depilatory cream. NOTE: The depilatory cream is soluble in water. Complete removal of the cream will prevent a greasy surface and ensure a better pricking result. Use a sterile cotton swab soaked in 70% ethanol to disinfect the skin surface. Mark the target area (1 cm x 1 cm) on the depilated skin with a pre-measured stencil. NOTE: Marking the target site will help to apply the needle bundle up-and-down within a defined area. This is important to ensure delivery of the same amount of DNA to a specific surface area to minimize experiment-to-experiment variation. Place a 10 μL drop of plasmid DNA (10 μg) onto the marked skin. NOTE: The amount of DNA for acufection varies with different genes and the type of expression vector. The amount of DNA used should be carefully titrated before conducting the experiment of interest. The 10 μL is a small liquid drop and it sits well on the shaved and depilated skin without rolling down while pricking. Include a control group of mice treated with 10 μL empty vector DNA to compare with mice acufected with the study gene. Hold the acupuncture needle bundle (Figure 1B) and prick the marked surface with an up-and-down motion for 100 times or until the moisture from DNA in PBS on the skin disappears. NOTE: Some redness of the skin surface may occur. Avoid making deep cuts that bleed. The number of up-and-down pricking motions on the skin surface is operably determined when the moisture from DNA in PBS (10 μL) disappears on the skin. We decided 100 times in 30 s because it has given the most consistent results from acufection-delivered genes. If applicable, the needles can be reused for up to 6 target skin pricks (1 cm x 1 cm each). Rinse the needles in 70% ethanol and PBS between acufection. Change to new needles when they are dull or for different plasmid DNA to avoid cross contamination. Place acufected mice on a heating pad to maintain the body temperature until awake. Return mice to their cage when they have regained sufficient consciousness. Note: Keep acufected mice in separate cage (less than 5 animals per cage) from the cage of un-acufected mice. Put water bottle in place and return the cage to the IVC (individually ventilated cage) rack. For the first 48 h after the procedure, closely monitor mice for any discomfort including behavioral changes (restlessness, agitation or eating disorder) or abnormal appearance (rough hair coat or hunched posture). NOTE: Transcriptional expression and protein production of acufected gene are detectable on day 3. Mice acufected with plasmid of interest can be treated with different types of stimulants 3 days after transfection. We illustrate here by treating the IL-15ΔE7-acufected mouse skin with IMQ cream. IMQ is an imidazoquinolin amine approved for treating external genital and perinatal warts13. Topical IMQ treatment is shown to induce human psoriasis-like skin disorders in mice with the manifestation of flaky skin, epidermal proliferation and dermal neutrophil infiltration12,14,15 . NOTE: The plasmid vector contained full-length mouse IL-15 cDNA, under the regulation of elongation factor-1 α (pEF), flanked with an IL-2 signal peptide and a FLAG tag at the C-terminus (pEF-IL-15, 5859 base pairs), which was constructed as described by Bamford et al.16. The plasmid is used as an IL-15 template to delete the first 16 amino acids at residues 33 - 48 in exon 7 of the IL-15 gene for IL-15ΔE7 (pEF-IL-15ΔE7, 5,811 base pairs) by SOE (synthesis by overlap extension) PCR method17. Bacterial colonies that were successfully transformed with IL-15ΔE7 were verified by restriction enzyme digestion and followed by DNA sequencing12,18. A large quantity of endotoxin-free plasmid DNA was prepared as described in the protocol step 2. Anesthetize acufected mice by intraperitoneal injection of tribromoethanol (400 μg per gm body weight) and apply vet ophthalmologic ointment on eyes to prevent dryness under anesthesia. Check the toe pinch reflex to assure sufficient depth of anesthesia before the start of the operative procedures. NOTE: Since a 2 cm x 2 cm skin will be treated for IMQ, 2 doses of pIL-15ΔE7 plasmid DNA (10 μg in 10 μL PBS per dose) is acufected on 2 target sites (1 cm x 1 cm each). Mark flank skin (2 cm x 2 cm) covering the acufected area. Use Q-tip applicator to topically apply IMQ cream on the marked surface area. Note: step 5.1 is only carried out for the first dose (60 mg/dose). The next consecutive doses are applied to non-anesthetized mice. Document the changes of IMQ-treated dorsal skin daily with a high definition camcorder. Note: One person holds the mouse while another is recording. Still pictures are shot and edited at a later time. Euthanize mice by injecting an overdose of tribromoethanol (800 μg per gm body weight) followed by cervical dislocation on day 4 or day 7 after IMQ treatment. Skin is excised and processed (Steps 4.1 - 4.5). Use a pair of surgical scissors to make a horizontal cut from the base of the tail. Proceed bilaterally to the base of the hindlimb and continue to cut vertically along the flank to the base of the forelimb. Carefully peel the skin from the underlying tissue from posterior to the anterior. Use the scissors to cut off the dorsal skin. Place the skin on a sterile Petri dish. Use a scalpel to excise target skin and freeze it in liquid nitrogen immediately. Note: The same size of acufected skin without (1 cm x 1 cm) or with IMQ treatment (2 cm x 2 cm) is fixed for each mouse to minimize experiment-to-experiment variations. Place the frozen skin tissue at the center of a pre-chilled 2-compartment mortar with handles and a pestle. Use a lead hammer on the mortar to pulverize the tissue. Quickly place the pulverized tissue to a new tube containing 500 μL of cell lysis reagent for RNA extraction or to a tube containing 50 μL of PBS and 1x protease inhibitor cocktail to obtain protein lysate. Place the skin tissue in a cassette and immerse it in 4% paraformaldehyde overnight. Embed and section tissue, which in our case was performed by the Pathology Laboratory at the LAC, NTU. Note: The section is cut at a thickness of 5 μm. Place tissue sections onto positively charged slides. Heat the slides at 65 °C for 15 min. Place the slides in a staining rack. Immerse the rack into corresponding tank containing xylene substitute for 5 min twice followed by sequential immersion in 100%, 95%, 80%, 75%, 60% and 50% ethanol (5 min each) for rehydration. Immerse the slides in tap water for 3 min before staining. Perform hematoxylin and eosin staining. Note: H & E stain was performed upon request at Pathology Laboratory at the LAC, NTU. For immunohistochemical stain, block the section with block solution at room temperature for 5 min to reduce non-specific background staining. Note: The block solution is commercially developed with immunostaining techniques. No animal serum is contained in this product. Dip the slide in PBS to rinse out the block solution. Dilute the block solution in PBS at 1:10 and add 2% fetal bovine serum (FBS) (diluent solution). Pipette the appropriately diluted primary antibody onto the section and incubate for 60 min at room temperature. Note: Antibodies are diluted in diluent solution. Antibody concentrations for this staining have been optimized at 1:800 and 1:200 for Ki67 (clone SolA15) and Ly6G (clone 1A8), respectively. These concentrations are found to show distinct stain without background staining. Stain one serial section in the same run with the same solution omitting the primary antibody to control for non-specific binding of the secondary antibody. Wash slides three times in TBS plus 0.1% Tween-20 (TBST solution) for 5 min each. Change solution between washes. Pipette one drop of labeled polymers to each section and incubate at room temperature for 40 min. Note: The labeled polymer is commercially prepared by combining amino acid polymers with peroxidase and secondary antibody which is reduced to a Fab' fragment. The reagent is ready to use for immunohistochemical staining of mouse tissue sections. Wash slides three times in TBST for 5 min each. Change solution between washes. Pipette 3,3'-diaminobenzindine tetrahydrochloride (DAB) solution onto tissue section and let stand at room temperature until a brown precipitate is visible under a bright field microscopy. Note: The time for DAB to precipitate in the presence of peroxidase is around 30 min. Immerse slides in water to stop peroxidase activity. Dip slides in methyl green solution for nuclear staining. Wash slides three times in PBS for 5 min each. Place a coverslip over the stained section that is covered with permanent mounting medium (8 μL per section). Scan the whole stained sections using a scanscope with a 20X objective. Measure the epidermal thickness within a 1-mm segment of the epidermis and count the number of Ki67-immunoreactive cells within the segment. NOTE: Quantitative analysis is performed using microscopy automation & image analysis software. Epidermal thickness is defined by the distance between the basal layer and the outermost layer of the epidermis. Count the number of Ly6G-immunoreactive cells in the dermal area (230 x 270 μm2 rectangle) immediately below topical IMQ-treated skin. While some redness was evident within the first hour after pricking with acupuncture needles, the skin cleared on day 2 and no adverse skin reaction up to day 7 was observed after pricking (Figure 2A). Needle pricking induced very low level of epidermal orthokeratosis and minimal dermal infiltration by H&E analysis compared with untreated skin (Figure 2B). 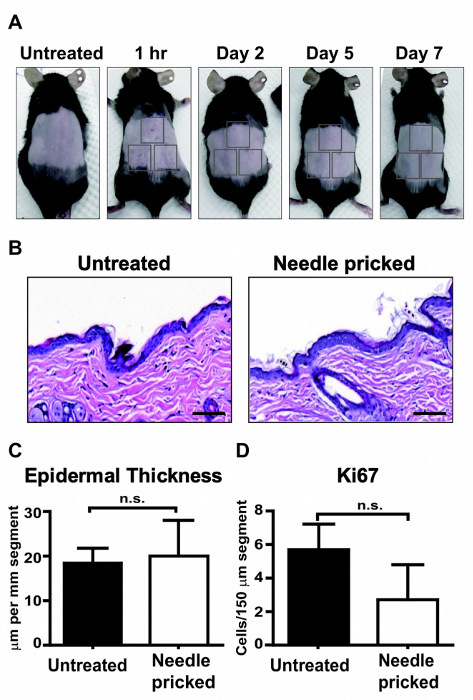 The epidermal thickness (Figure 2C) and the number of Ki67+ cells (Figure 2D) were comparable between needle-pricked and untreated skin, demonstrating that acupuncture needle-pricked skin did not cause noticeable tissue disruption or cellular proliferation in the epidermis. Compared to the syringe needle (1.067 mm in diameter)12, pricking with acupuncture needles induced reduced levels of the expressions of chemokine CXCL-1 and proinflammatory cytokine IL-6 on day 2 that continued to decrease on day 5 (Figure 3A). To validate the expression of the acufected transgene in mouse skin, a plasmid expressing IL-15 cDNA was acufected in the skin of IL-15-deficient C57BL/6 (IL-15 KO) mice. Although low levels of transcription from acufected plasmid DNA were observed in depilated skin, oscillation with acupuncture needles enhanced the level of gene transcription (Figure 3B). IL-15 production was detected on day 2 and remained stable up to day 7 (Figure 3C). These results demonstrate that acufection effectively infuses the plasmid DNA and allows the expression of the encoded protein in the skin without inducing excessive keratinocyte activation. WT mice were acufected with a plasmid encoding IL-15ΔE7. Mice expressed IL-15ΔE7 mRNA and the protein until 3 days after transfection (Figure 4A). The mice were then topically treated with IMQ cream on day 3. While IMQ treatment induced silvery flakes in control WT mice, IMQ-induced silvery flakes were reduced in IL-15ΔE7 acufected WT mice (Figure 4B). Interestingly, expression of acufected IL-15ΔE7 significantly inhibited Ly6G+ neutrophil infiltration into IMQ-treated skin compared with unacufected WT skin (Figure 4C)12. By acufection, we demonstrated the novel function of IL-15ΔE7 in the skin. 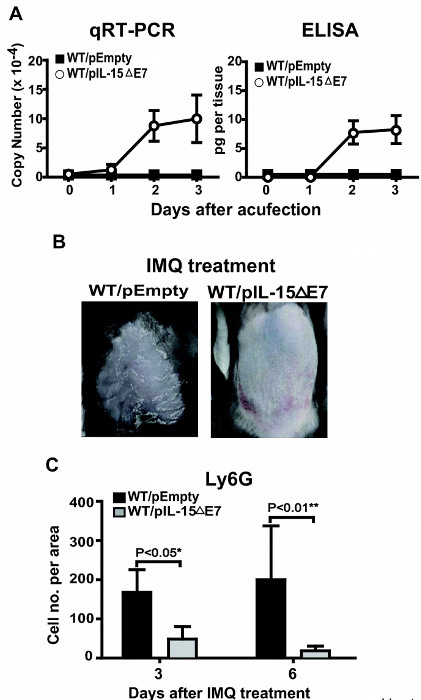 IL-15ΔE7 modulates IMQ-inducing neutrophil infiltration. Figure 1. Illustration of Acupuncture Needles. (A) The acupuncture needle (36 G x 0.5") is composed of a handle and a needle end. (B) Ten acupuncture needles are bound in a bundle using adhesive tapes. The length of the bundle is approximately 4 cm as measured by the ruler (lower panel). Please click here to view a larger version of this figure. Figure 2. Pricking by Acupuncture Needles Does Not Cause Noticeable Skin Damage or Keratinocyte Activation. (A) Triple sites marked in grey squares on the shaved and depilated flank skin of the mouse was pricked 100 times each by acupuncture needles. Photographs were taken on the first hour and up to 7 days after pricking to monitor the skin damage. Shaved and depilated skin without needle pricking was used as the control. (B) H&E analysis of formalin-fixed, paraffin embedded skin sections from untreated or needle-pricked mouse skin. Scale bar: 100 µm. (C) One millimeter-segment of H&E stained sections from untreated or needle-pricked mouse skin was selected for measuring the epidermal thickness (the distance from basal to the outermost layer). Each bar represents the mean of the epidermal thickness measured from 3 skin sections. Error bar represents the standard error of the mean (SEM). The significance of difference between groups was tested by unpaired Student's t test. (D) Serial sections of the same samples were stained with anti-Ki67 for immunohistochemical analysis. Each bar represents the mean of Ki67+ cells localized in every 150 µm-epidermis in length per 1 mm segment. Error bar represents the standard error of the mean (SEM). The significance of difference between groups was tested by two-way ANOVA followed by Bonferroni's post hoc test. (n.s. : not significant). Please click here to view a larger version of this figure. Figure 3. Acufection Effectively Expresses the Protein of Interest Without Causing Noticeable Keratinocyte Activation. (A) Shaved and depilated flank skin was left untreated (NTC), abrading with 1.067 mm-diameter (19 G) syringe needle (Syr.) or pricking 100 times by acupuncture needles (Acu.). The transcriptional levels of CXCL-1 and IL-6 on day 2 and day 5 were measured by qRT-PCR (n=3). (B) Shaved and depilated skin of IL-15-deficient mouse was topically applied with a drop of a plasmid DNA expressing IL-15 without (depilation) or with acupuncture needle pricking (depilation+prick). Transcription of IL-15 in each group on day 2 was measured by TaqMan qRT-PCR. Transcription of IL-15 was undetectable in PBS control (NTC) of IL-15-deficient mice. (C) IL-15 production from IL-15-deficient mouse skin that was untreated or IL-15-acufected for various days (one tissue for each day) were measured by IL-15 ELISA. Please click here to view a larger version of this figure. Figure 4. Demonstration of IL-15ΔE7 Attenuates IMQ-induced Silvery Flaky Skin and Inhibits Neutrophil Infiltration. (A)The transcriptional level and protein production of IL-15ΔE7-acufected (WT/pIL-15ΔE7) or empty vector-control (WT/pEmpty) skin were measured by qRT-PCR and ELISA (n=2, each time point), respectively. (B) Empty vector- or IL-15ΔE7-acufected flank skin at day 3 was topically treated with IMQ cream (60 mg). Photographs of WT/pEmpty and WT/pIL-15ΔE7 mouse flank at day 6 after IMQ treatment. (C) Skin sections from WT/pEmpty or WT/pIL-15ΔE7 mice after IMQ treatment on days 3 and 6 were stained with anti-Ly6G antibody and enumerated. Each bar represents the mean of Ly6G+ cells from 4 IMQ-treated mice. Error bar represents the standard error of the mean (SEM). The significance of difference between groups was tested by two-way ANOVA followed by Bonferroni's post hoc test. Panels A and C are modified with permission from the Journal of Investigative Dermatology, License Number 3901890227597. Please click here to view a larger version of this figure. The most critical step to ensure the expression of the acufected plasmid DNA is to evenly oscillate and loosen the horny layer of the skin. While pushing the needles gently without cutting the skin, the force should be hard enough to depress the surface. To facilitate absorption of DNA in 10 μL solution on a 1 cm x 1 cm surface area, the needles should oscillate up-and-down for about 100 times in 30 s. One can determine the force that needs to prick the skin and by noting the number of times that is needed to yield the best expression level of the acufected gene. Modification for the amount of plasmid DNA applied to reach a satisfactory level of expression after acufection may be needed because it can vary for different genes. Titration experiments should be performed to determine the optimal quantity of plasmid DNA to be applied before the experiment as well. Results from quantitative RT-PCR analysis will help to determine the optimal quantity of plasmid DNA and the best condition to obtain reproducible results. The precise mechanism of the acufection process remains to be clarified. 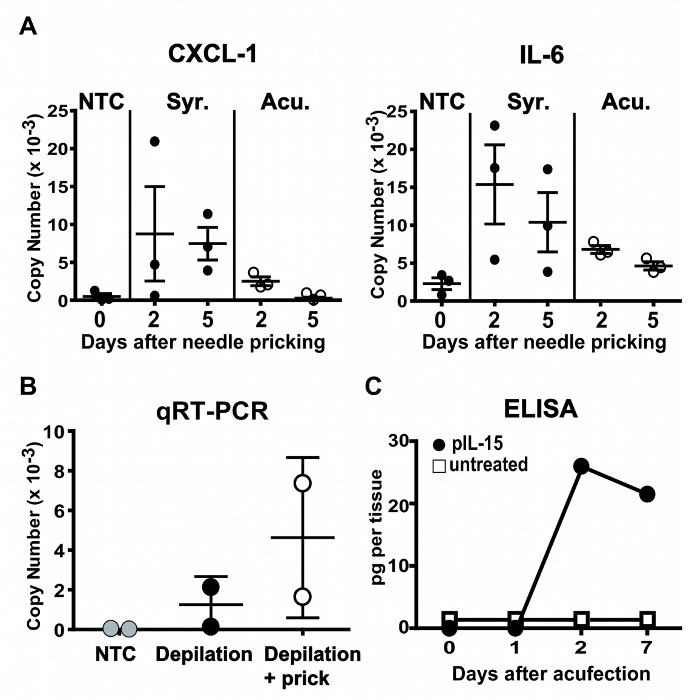 While transcription from topically delivered plasmid DNA occurred in shaved and depilated skin at low level, pricking by acupuncture needles enhanced transfection efficiency (Figure 3B). By analogy of microseeding protocol in which multiple perforations with the tattoo gun11, acufection-delivered plasmid DNA is likely facilitated through the scrape of cell membrane of keratinocytes and hair follicles19,20. Stimulations of the epidermis by hair removal, depilating reagent and needle oscillation can induce keratinocyte activation to some extent and further enhance DNA uptake by Langerhans and DCs6. A limitation of this protocol is that the amount of plasmid DNA taken up by cells may not be accurately controlled. We do not suggest using this method to treat a large skin area. To minimize variations in the expression levels of the delivered gene among experiments, the volume of the DNA solution and the size of target skin surface should be fixed for the same set of experiments. To generate reproducible results, it is advisable that replicate experiments are to be performed by the same individual. With respect to the gene gun device and microseeding, the use of a bundle of acupuncture needles to deliver naked DNA is inexpensive. The procedures are also straightforward. It requires very little technical experience to follow the acufection protocol. Acufection causes minimal trauma to animals and no weight loss is found after the operation. The level of pain is low as judged by the absence of significant behavioral change after acufection operation. In summary, using acupuncture needles to loosen the horny layer of the skin for DNA uptake by host cells provides an economical alternative method to express a protein in mouse skin. A wide spectrum of immune-related genes have yet to be functionally characterized in the skin21, and this highlights the need for a quick study of a novel gene on the skin. Employing this method, one can readily determine whether the product of the gene of interest has any novel function. This acufection protocol provides a convenient and feasible tool for new discoveries in modulating immune response to cure cutaneous disease. This work was supported by grant from the Ministry of Science and Technology (MOST 103-2633-B-002-002; 104-2320-B-002-048). We thank Drs. Betty Wu-Hsieh and Chien-Kuo Lee at NTU, Leigh Zerboni at Stanford University and Dr. Peter Hoffmann at the University of Hawaii for reading the manuscript, Yun Chien at NTU for technical assistance, and Dr. Wen-Chi Wei at Agriculture Biotechnology Research Center at Academia Sinica for technical advice. Effendy, I., Loffler, H., Maibach, H. I. Epidermal cytokines in murine cutaneous irritant responses. Journal of applied toxicology : JAT. 20, 335-341 (2000). Nestle, F. O., Di Meglio, P., Qin, J. Z., Nickoloff, B. J. Skin immune sentinels in health and disease. Nature reviews. 9, 679-691 (2009). Liu, L. J., et al. Topical application of HIV DNA vaccine with cytokine-expression plasmids induces strong antigen-specific immune responses. Vaccine. 20, 42-48 (2001). Lu, B., Federoff, H. J., Wang, Y., Goldsmith, L. A., Scott, G. Topical application of viral vectors for epidermal gene transfer. J Invest Dermatol. 108, 803-808 (1997). Partidos, C. D. Delivering vaccines into the skin without needles and syringes. Expert Rev Vaccines. 2, 753-761 (2003). Peachman, K. K., Rao, M., Alving, C. R. Immunization with DNA through the skin. Methods. 31, 232-242 (2003). Yang, N. S., Burkholder, J., Roberts, B., Martinell, B., McCabe, D. In vivo and in vitro gene transfer to mammalian somatic cells by particle bombardment. Proc Natl Acad Sci U S A. 87, 9568-9572 (1990). Tang, D. C., DeVit, M., Johnston, S. A. Genetic immunization is a simple method for eliciting an immune response. Nature. 356, 152-154 (1992). Haynes, J. R. Particle-mediated DNA vaccine delivery to the skin. Expert Opin Biol Ther. 4, 889-900 (2004). Tuomela, M., et al. Biodistribution and general safety of a naked DNA plasmid, GTU-MultiHIV, in a rat, using a quantitative PCR method. Vaccine. 23, 890-896 (2005). Eriksson, E., et al. In vivo gene transfer to skin and wound by microseeding. J Surg Res. 78, 85-91 (1998). Lee, T. L., et al. An alternatively spliced IL-15 isoform modulates abrasion-induced keratinocyte activation. J Invest Dermatol. 135, 1329-1337 (2015). Rudy, S. J. Imiquimod (Aldara): modifying the immune response. Dermatol Nurs. 14, 268-270 (2002). van der Fits, L., et al. Imiquimod-induced psoriasis-like skin inflammation in mice is mediated via the IL-23/IL-17 axis. J Immunol. 182, 5836-5845 (2009). Sumida, H., et al. Interplay between CXCR2 and BLT1 facilitates neutrophil infiltration and resultant keratinocyte activation in a murine model of imiquimod-induced psoriasis. J Immunol. 192, 4361-4369 (2014). Bamford, R. N., DeFilippis, A. P., Azimi, N., Kurys, G., Waldmann, T. A. The 5' untranslated region, signal peptide, and the coding sequence of the carboxyl terminus of IL-15 participate in its multifaceted translational control. J Immunol. 160, 4418-4426 (1998). Horton, R. M., Hunt, H. D., Ho, S. N., Pullen, J. K., Pease, L. R. Engineering hybrid genes without the use of restriction enzymes: gene splicing by overlap extension. Gene. 77, 61-68 (1989). Tan, X., Lefrancois, L. Novel IL-15 isoforms generated by alternative splicing are expressed in the intestinal epithelium. Genes Immun. 7, 407-416 (2006). Basner-Tschakarjan, E., Mirmohammadsadegh, A., Baer, A., Hengge, U. R. Uptake and trafficking of DNA in keratinocytes: evidence for DNA-binding proteins. Gene Ther. 11, 765-774 (2004). Fan, H., Lin, Q., Morrissey, G. R., Khavari, P. A. Immunization via hair follicles by topical application of naked DNA to normal skin. Nat Biotechnol. 17, 870-872 (1999). Kennedy-Crispin, M., et al. Human keratinocytes' response to injury upregulates CCL20 and other genes linking innate and adaptive immunity. J Invest Dermatol. 132, 105-113 (2012).